خسروشاهی بناب, مریم, حسامی, منصور. (1396). بررسی بازنمود روان‌زخم فردی و جمعی ناشی از دو جنگ جهانی در هنر با نگاهی به آثار دو تن از نقاشان آلمانی. 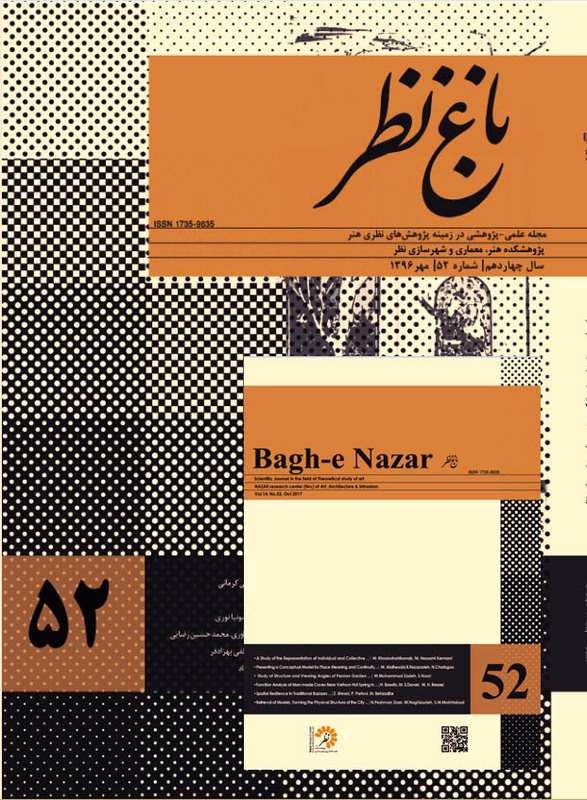 ماهنامه علمی پژوهشی باغ نظر, 14(52), 5-16. مریم خسروشاهی بناب; منصور حسامی. "بررسی بازنمود روان‌زخم فردی و جمعی ناشی از دو جنگ جهانی در هنر با نگاهی به آثار دو تن از نقاشان آلمانی". ماهنامه علمی پژوهشی باغ نظر, 14, 52, 1396, 5-16. خسروشاهی بناب, مریم, حسامی, منصور. (1396). 'بررسی بازنمود روان‌زخم فردی و جمعی ناشی از دو جنگ جهانی در هنر با نگاهی به آثار دو تن از نقاشان آلمانی', ماهنامه علمی پژوهشی باغ نظر, 14(52), pp. 5-16. خسروشاهی بناب, مریم, حسامی, منصور. بررسی بازنمود روان‌زخم فردی و جمعی ناشی از دو جنگ جهانی در هنر با نگاهی به آثار دو تن از نقاشان آلمانی. ماهنامه علمی پژوهشی باغ نظر, 1396; 14(52): 5-16. از سده بیستم و پس از تجربه دو جنگ جهانی و فجایع بشری دیگر، مفهوم روان‌زخم به مثابه پدیده‌ای فردی و جمعی هر چه بیشتر در محافل علمی و نیز سپهر عمومی مطرح شده است. با وجود دشواری تعیین مرزهایی روشن برای تعریف یک دسته‌بندی مشخص از عوامل پیدایش روان‌زخم فردی و جمعی، همچنان می‌توان با اطمینان جنگ را پدیده‌ای آسیب‌زا دانست و مفهوم روان‌زخم ناشی از جنگ را طرح کرد. روش تحقیق : برای نیل به پاسخ پرسش‌های این تحقیق، نخست به طرح نظریات روان‌کاوی در باب روان‌زخم (و بالاخص روان‌زخم ناشی از جنگ) با تکیه بر آرای فروید در این زمینه پرداخته می شود. این رویکرد روان‌کاوانه در جریان تحلیل محتوای آثار به مثابه نقطه عزیمتی خواهد بود که ارزیابی شرایط فرهنگی و اجتماعی و نیز زندگی‌نامه‌ هنرمند در نسبت با آن صورت می‌گیرد. بر این اساس این پژوهش نشان می‌دهد که آثار هنری محملی برای بازنمود خاطرات روان‌زخم فردی و جمعی هستند. برای شناخت بهتر جنبه‌های مختلف فردی و جمعی روان‌زخم ناشی از جنگ، دو هنرمند آلمانی از دو نسل مختلف برای مطالعه موردی انتخاب شده‌اند. تعلق یکی به نسلی که جنگ را تجربه کرده است و دیگری به نسلی که پیامدهای جنگ را از نسل والدین خود میراث برده است، امکان مطالعه بهتر بازنمود روان‌زخم به مثابه تجربه ای فردی یا جمعی را فراهم می‌آورد. هدف از تحقیق : پژوهش حاضر می‌کوشد نشانه‌ها و ویژگی‌هایی را که روان‌کاوی برای تشخیص روان‌زخم تعیین کرده است، در آثار دو نقاش آلمانی پس از دو جنگ جهانی، به مثابه بازنمودی از روان‌زخم فردی و جمعی ناشی از جنگ بیابد و محتوای این آثار را با خوانشی روان‌کاوانه تشریح کند. این پژوهش امکان شناخت بهتر آثار تحلیل‌شده را فراهم می‌آورد و ضمناً الگویی برای مطالعه وجوه بازنمود روان‌زخم جنگ آثار مشابهی که در سایر دوره‌های تاریخی یا سایر جوامع پس از جنگ خلق شده‌اند، ارایه می‌ کند. Since the 20th century and following the experience of two world wars and other human catastrophes, the concept of trauma, as an individual and collective phenomenon, has been widely discussed in both scientific and public spheres. Although it is difficult to determine clear boundaries for the categorization of factors causing individual and collective trauma, war can be regarded as a traumatic phenomenon and the concept of trauma resulting from war trauma can be thus advanced. The present research focuses on the representation of individual and collective war trauma in works of art with a look at the paintings of two German artists in the years following World War I and World War II. This study aims to trace and study the interactional relationship of these works with individual and collective trauma in the cultural and social context of the post-war society in the defeated country. In fact, this study tries to answer these questions: how does the representation of individual war trauma in these paintings interact with collective trauma in the setting of the post-war society? How can the representation of collective trauma in works of art by different post-war generations be explained by Freudian and post-Freudian psychoanalytical theories? To answer the research questions, first psychoanalytical theories about trauma (especially war trauma), with an emphasis on the ideas of Freud, will be discussed. In the course of the content analysis of the works of art, this psychoanalytical approach will serve as a departure point in relation to which the assessment of cultural and social conditions and the biography of the artists will be undertaken. Thus, this study shows that works of art can serve as a means of representation of the memories of individual and collective trauma. For a better understanding of the different individual and collective aspects of war trauma, two German artists from two different generations have been selected for the case study. The fact that one of them belongs to a generation that has experienced war and the other is from a generation that inherited the consequences of war from the generation of their parents, provides us with a better opportunity to study the representation of trauma as an individual or collective experience. The present study tries to identify the signs and features determined in psychoanalysis to diagnose trauma in the works of two German painters from the era following the two world wars as a representation of individual and collective war trauma and explain the content of these works through a psychoanalytic reading. This study provides for a better understanding of the analyzed works and develops a model for the study of the representation of war trauma in similar works in other societies and historical eras following different wars. فروید، ‌زیگموند. 1382. ورای اصل لذت.‌ ت : یوسف اباذری. ارغنون، 21 (6):25-82. Alexander, Jeffrey C. (2004). Toward a Theory of Cultural Trauma. In Cultural Trauma and Collective Identity. Berkeley: University of California Press. Alexander, Jeffrey C., et al., (2004). Cultural Trauma and Collective Identity. Berkeley: University of California Press. Biro, M. (2009). The Dada Cyborg: Visions of the New Human in Weimar Berlin. Minneapolis: University of Minnesota Press. Brenner, I. (2011). An Unusual Manifestation of Repetition Compulsion in Traumatized Patients. In On Freud’s Beyond the Pleasure Principle. Edited by Salman Akhtar and Mary Kay O’Neil. London: Karnac. Caen Memorial Museum. (1998). Otto Dix - The Death. Art of the First World War. Available from: http://www.memorial-caen.fr/10EVENT/EXPO1418/gb/texte/099text.html. Crockett, D. (1999). German Post-Expressionism: The Art of the Great Disorder, 1918-1924. University Park: Pennsylvania State University Press. Fehlemann, S. & Löffelbein, N. (2016). Gender, Memory and the Great War: The Politics of War Victimhood in Interwar Germany. In Psychological Trauma and the Legacies of the First World War. New York: Palgrave Macmillan. Fox, P. (2006). Confronting Postwar Shame in Weimar Germany: Trauma, Heroism and the War Art of Otto Dix.Oxford Art Journal, 29 (2): 247–67. doi:10.1093/oxartj/kcl006. Freud, S. (2012). Selected Papers on Hysteria and Other Psychoneuroses. New York: The Journal of Nervous and Mental Disease Publishing Company. Freud, S. (1913). Totem and Taboo: Some Points of Agreement between the Mental Lives of Savages and Neurotics. Translated by Strachey, J. London: Taylor & Francis. Friedländer, S. (1979). When Memory Comes. New York: Farrar, Straus and Giroux. Gillen, E, (ed). (1997). German Art from Beckmann to Richter; Images of a Divided Country. Cologne: DuMont. Hake, S. (2008). German National Cinema. 2nd ed. London: Routledge. Köhne, J. (2016). Screening Silent Resistance: Male Hysteria in First World War Medical Cinematography. In Psychological Trauma and the Legacies of the First World War. New York: Palgrave Macmillan. Langenbacher, E. (2010). Still the Unmasterable Past? The Impact of History and Memory in the Federal Republic of Germany. German Politics, 19 (1): 24–40. doi:10.1080/09644001003588473. McGreevy, L. F. (2003). Bitter Witness: Otto Dix and the Great War. Bern: Peter Lang. Mucci, C. (2013). Beyond Individual and Collective Trauma: Intergenerational Transmission, Psychoanalytic Treatment, and the Dynamics of Forgiveness. London: Karnac. Radstone, S. & Hodgkin, K. (eds). (2003). Regimes of Memory. London: Routledge. Seltzer, M. (1997). Wound Culture: Trauma in the Pathological Public Sphere. October, (80): 3-26. doi:10.2307/778805. Stahl, D. C. & Williams, M. (eds). (2010). Imag(in)ing the War in Japan: Representing and Responding to Trauma in Postwar Literature and Film. Leiden: Brill. Sztompka, P. (2004). The Trauma of Social Change: A Case of Postcommunist Societies. In Cultural Trauma and Collective Identity. Berkeley: University of California Press. Wilmes, U. (ed). (2014). Georg Baselitz: Back Then, In Between, and Today. Munich: Prestel.